The panel, in a petition issued earlier Wednesday, argued that the pipeline had been exposed by the appearance of sinkholes near the construction of two other pipelines – Mariner East 2 and 2X – at several places in Chester County’s West Whiteland Township in recent days. In a four-page order, Brown agreed with the panel, saying that risks to the public outweigh risks to the shippers of natural gas liquids. “I agree with BIE that permitting the continued flow of hazardous liquids through the ME1 pipeline without the proper steps to ensure the integrity of the pipeline could have catastrophic results impacting the public,” Brown wrote. She ordered Sunoco to run an inspection tool through Mariner East 1 for one mile on either side of the location where the sink holes were found, within 24 hours of the order being issued. Within 12 hours of completing the inspection, Sunoco will then shut down the line for an estimated 10-14 days, during which it will study geological conditions and submit its findings for approval by PUC inspectors. 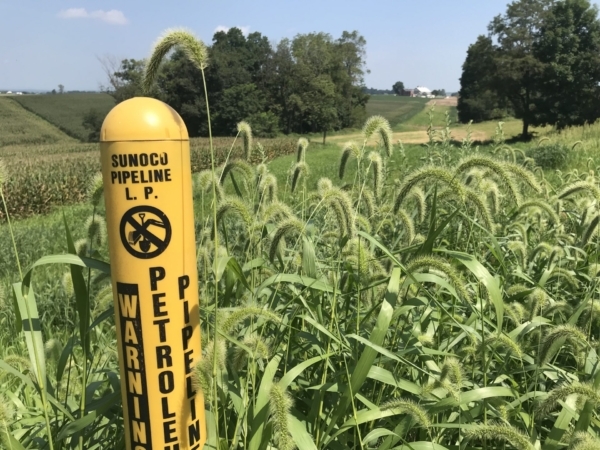 Sunoco will not be allowed to resume operation of the pipeline until it meets all safety requirements set down by PUC inspectors, the order said. 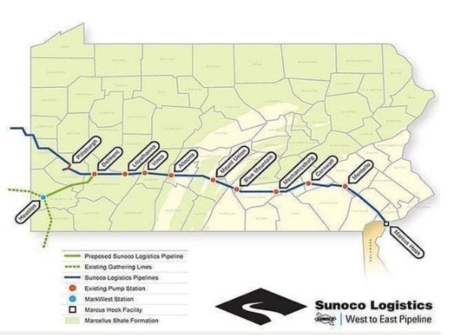 Sunoco spokesman Jeff Shields, in a statement issued late Wednesday, said the company will comply with the PUC’s order over the next 10-14 days but insisted that Mariner East 1 is safe. 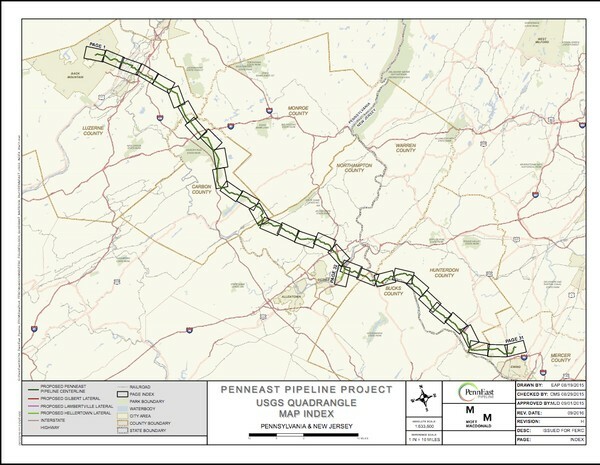 “This period should allow us to share what our professional geologist has established to date — that the Mariner East 1 pipeline is stable, is located in suitably safe geology, and will continue to operate safely as it has done for decades. The safe operation of our pipelines is of critical importance to us, and we believe the study period will reaffirm the safety of the pipeline,” he said. Shields said the order does not affect construction for the Mariner East 2 pipelines, which continues throughout the state. 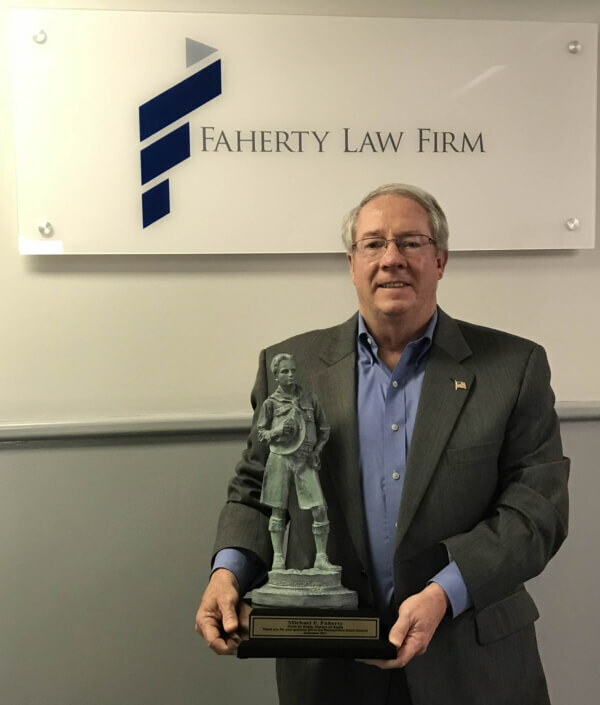 The order is a victory for anti-pipeline campaigners who have argued that natural gas liquids represent a threat to public safety, especially in densely populated areas like the suburbs of Philadelphia. 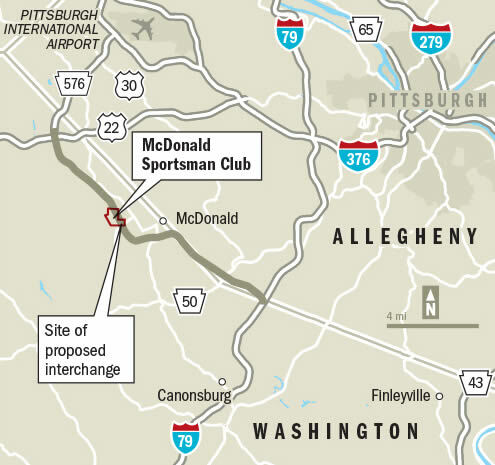 Mariner East 1, which was built in the 1930s, has been repurposed to carry ethane, propane and butane from the Marcellus Shale of southwest Pennsylvania to a terminal at Marcus Hook near Philadelphia, where most of it will be exported. The existing pipeline runs parallel to the two new lines. The first, ME2, is scheduled for completion by the end of the second quarter. In its petition, the panel said it is concerned about how close homes and an Amtrak line are to the existing pipeline, and to the construction of the new lines, after the sinkholes appeared. In language similar to that frequently used by community groups opposing the Mariner East project, especially in Philadelphia’s western suburbs, the PUC panel said public safety would be “jeopardized” without the proposed review of pipeline integrity. PHMSA spokesman Darius Kirkwood said the agency is investigating the sinkholes and looking into whether Sunoco complied with pipeline construction safety rules. The first sinkhole, measuring about eight feet wide by three feet deep, was discovered in December last year just south of railroad tracks used by Amtrak, the document said. A second hole, about 15 feet deep, was discovered on March 1 about 300 feet from the rail line, and a third, about 15 feet wide and 20 feet deep, was found on a private property at Lisa Drive in West Whiteland on March 3, the document said. The third sinkhole was about 10 feet from a foundation wall of a house on that property, and partially exposed the ME1 pipeline, the petition said. It said that Sunoco did not notify PUC or PHMSA about the sinkholes, and that the company’s own Compliance Group was unaware of the events until March 3. All three sinkholes were filled with a concrete mix on March 3, and construction stopped when PUC inspectors visited the site on March 5. The inspectors found more sinkholes developing that were in the path of both ME1 and ME2X. Beth Toll, a spokeswoman for Amtrak, said inspectors had found no changes to track structures at the West Whiteland location during or since the construction of that part of the pipeline. Before PUC’s decision to temporarily shut down Mariner East 1, State Sen. Andy Dinniman, a Chester County Democrat who has argued that the local limestone geology does not support Sunoco’s drilling technique, urged the PUC to issue the emergency order. Clean Air Council, an environmental group that has led legal challenges to the Mariner project, also urged the PUC to shut down ME1 because of its proximity to “this densely-populated neighborhood with busy Amtrak railroad lines and unstable geology,” said executive director Joe Minott, in a statement. Sunoco restarted construction on the 350-mile cross-state lines in February after a month-long shutdown ordered by the Department of Environmental Protection in response to multiple violations. This story has been updated with comment from Sunoco. Photo caption: | Crews work to stabilize sinkholes in a West Whiteland Township neighborhood on March 3. 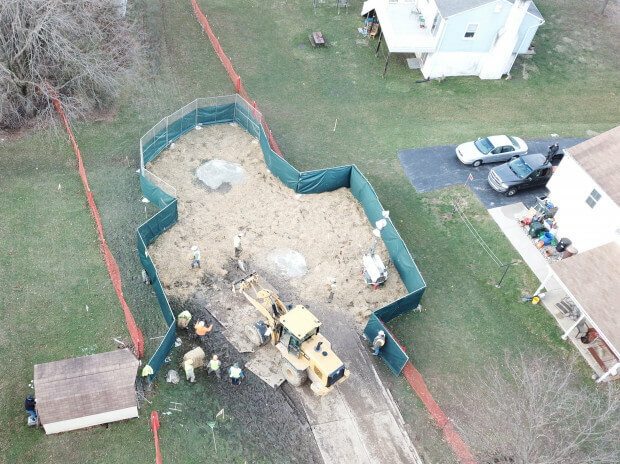 The sinkholes appeared recently near a construction site for the Mariner East 2 pipeline.